Rewards R US – Open an “R” Us Credit Card and get all of these great benefits! Earn $5 for every 125 points! Earning is easy; get 1 point for every dollar you spend at Toys “R” Us & Babies “R” Us stores. Rewards are delivered right to your email. Its free to enroll, just sign up in store or online at toysrus.com/myrewards. Even More Reasons to Join Rewards “R”Us! endless earnings – get up to 10% back on purchases made from your Babies”R”Us registry. No limits! Geoffrey’s Birthday Club – celebrate your child’s special day the Geoffrey way. Exclusive Offers & Perks – get members only savings delivered directly to your email. Plus, enjoy special deals from brands that fit your lifestyle. 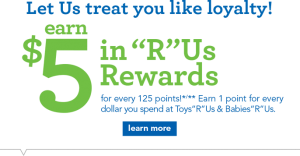 Points Banking – save your earned “R”Us Reward Dollars and use them when you want! With an “R” Us credit card, members earn 2 points for every $1 spent at “R”Us and “R”Us Mastercard cardholders earn 1 point for every $4 spent everywhere else Mastercard is accepted. Open an “R”Us credit card and receive exclusive savings on your first purchase in store or online upon account approval. Every Thursday, get 10% off in-store purchases made the “R” Us credit card. REWARDS PROGRAM: valid on “R”Us purchases. Excludes gift cards, squaretrade protection plans, assembly fees and shipping and handling. See the rewards program terms or toysrus.com/myrewards for full details. Geoffrey Birthday Club: Rewards “R”Us membership is required. see the program terms or toysrus.com/myrewards for details.